The modern workplace is changing. Command and control is giving way to buy-in and inclusion. Go-it-alone is evolving into highly collaborative teams. And a new generation won’t take orders for 30 years while banking on a cushy pension - if they don’t feel truly valued, challenged and engaged, your top talent will move on. We see a hunger for a new way of working: one that includes human values like integrity, courage, empathy and trust along with exciting outcomes like productivity, profit, efficiency and innovation. In fact, we believe these seemingly conflicting priorities go hand in hand. At The People Piece, we help values-driven organizations like yours successfully tackle one of the toughest challenges and greatest opportunities in today’s modern workplace: the people issues that can make, or break, the best laid strategies, products and operational plans. The result? Happier employees, greater efficiency, better results, higher retention, and the engagement, innovation, fulfillment and inspiration that come from being part of a truly great organization. Our seasoned trainers create interactive learning environments ideally suited for both veteran team members and a new generation that expects high levels of relatability, engagement, and practical application. Every organization is different. We get to know your business, your people, and your unique culture to create customized programs that are relevant to your learners and their most pressing needs. Change happens when learners practice new skills with the support of expert trainers and coaches. Our comprehensive programs and targeted interventions make sure the learning sticks and translates into results that last. At The People Piece, we firmly believe that leadership, teamwork and organizational cultures based on trust, communication and collaborative relationships are not only the right thing to do - they are essential to the success of any business strategy in today’s modern workplace. We partner with innovative, values-based organizations across the US, Europe and Asia to design and deliver highly engaging, tailored and impactful coaching, training and facilitation solutions that develop employees, managers, leaders, and teams to be their best and drive results by embodying the highest levels of healthy communication, collaboration, relationships, accountability and trust. 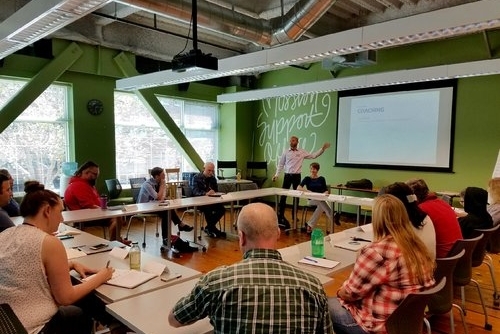 Learn more about how we’ve partnered with organizations including Pinterest, Whole Foods, and Solar Mosaic - as well as a range of startups and engineering firms - to develop outstanding leaders, managers and teams.